This is a friendly reminder that the Topping Out Ceremony will be held from 9:30 a.m. to 10:30 a.m. Oct. 14 at the Mary Ann Lee Plaza. Those who wish to sign the beam can do so as early as 7:30 a.m. More details can be found online at http://news.webster.edu/construction/2016/topping-off-ceremony.html. The first round of testing in the building enclosure mock-up of the ISB (located on the southwest corner of Parking Lot K) has been scheduled for 9:30 a.m. Oct. 6. As announced previously, the mock-up will be used for testing, inspection, training of the tradesmen and aesthetic purposes. The slab on grade concrete pour on Level 0 (the lowest level) has been scheduled for Oct. 7. Structural steel erection continues through the first week of November. Concrete is scheduled to be poured for floors on the second level Oct. 11 through Oct. 13. Concrete will be poured on the third level Oct. 19 through Oct. 21. Concrete grade beams and walls will be set on the south end of the building Oct. 4 through 13. The same work on the north end of the building is scheduled for Oct. 14 through Oct. 20. Beams and columns will be fireproofed Oct. 12 through Oct. 14. 28 of the 40 drilled piers have been completed. Drilling operations are expected to wrap up in by Oct. 17. Geotextile fabric covered with 12” of clean rock is being laid down at the site. This serves not only as a pad for cranes and delivery trucks, but also will help decrease the amount of dirt that gets tracked onto the streets and sidewalks. Street cleaning operations will continue to further control dirt and mud. The first grade beam concrete placement has been completed. The temporary guardrail on the east side of the existing garage is being installed. 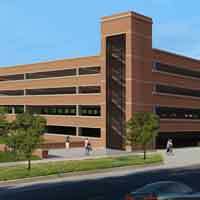 This may temporarily affect access to some parking spaces in the garage, but all spaces will be restored. That work is happening between 10 p.m. and 7 a.m., to further minimize disruption to the existing garage. Crews will pull the precast panels off the side of the existing garage October 15-18 in preparation of the precast delivery the week of Oct.24. Next week the underground shoring system on the southeast corner of the new building will be installed. This is required by MSD to prevent undermining the new garage in the event they ever need to repair the 15’-0” deep sewer lines along that façade at some time in the future.